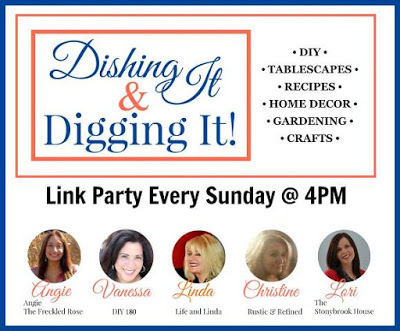 Welcome to the the Dishing It & Digging It Link Party. We appreciate you joining us. This past week, I shared my Autumn Tablescape from the blog hop Chloe from Celebrate and Decorated hosted. 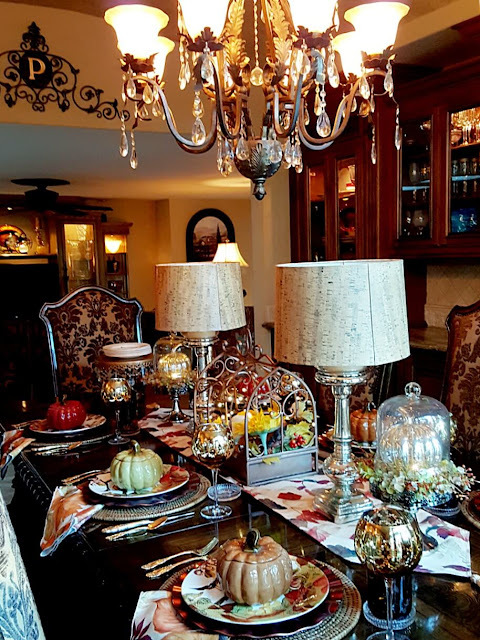 If you missed any of these lovely tablescapes on the blog hop, you should do some visiting and get inspired by so many wonderful Autumn tablescapes. Hi Linda, what a wonderful post filled with inspiration. 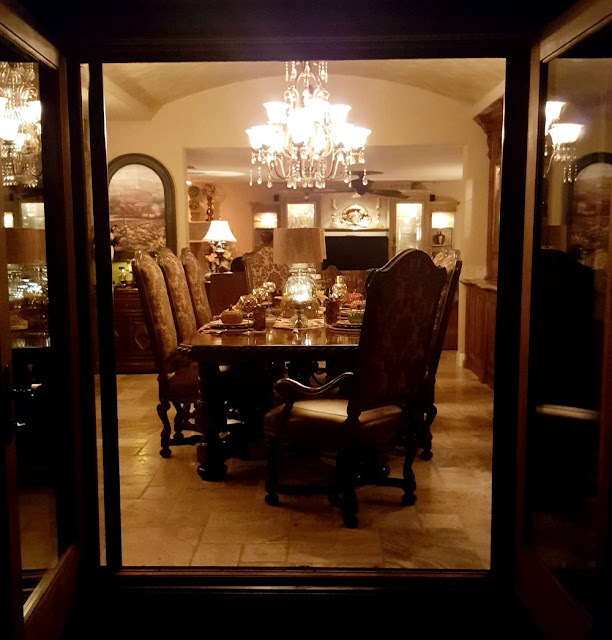 I love your tablescape and adore those lamps. Stunning! Great features once again. The copper yarn wreath is so simply yet elegant. Thank you for sharing and bringing this to us all. 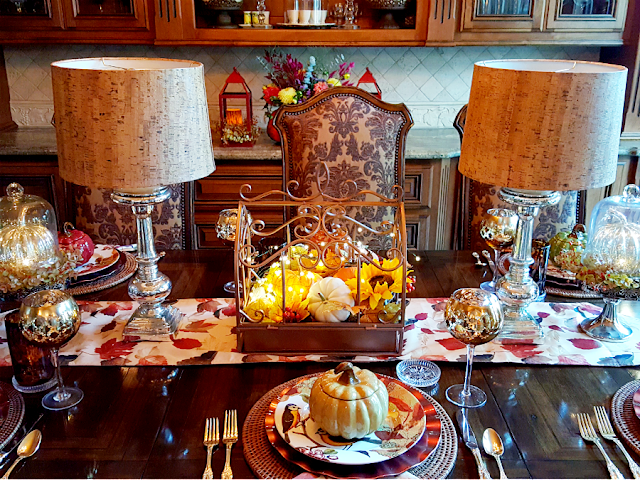 You ladies have made my day by selecting my Fall Tablescape as one of your favorites among such talented bloggers. Thank you so much! Thanks for hosting the party. You so deserve it. Happy to feature your lovely tablescape. Thanks again for joining us. Thank you for the party once again! Your tablescape was beautiful- I missed that post. I got a kick out of seeing a new blogger to me (highlighted from last weeks party) from the Keweenaw Peninsula where my Dad grew up in the upper peninsula of Michigan. How sweet is that Liz? Yes, loved her copper wreath. Thank you for hosing the party Linda! I LOVE your Fall tablescape and I adore the lamp table. What a fabulous idea! I may have to borrow that idea for a table very soon! Thanks Catherine. i love that you joined us. Your tablescape are lovely and creative. Thanks Michelle. Always good to see you here. Happy Fall. Thanks so much for selecting our planter post for this link party feature! A great Sunday night party. You are very welcome Jillian. Your planter and photography is outstanding. Hi Linda! Thank you for your party and hope you've had a nice weekend. Thank you dear Sheila. Wishing you a great week ahead. Thanks for hosting! Happy October! Thanks Trisha. You are certainly always welcome. Always look forward to all the link ups. Great features as well. Thank you Lauren. Loving your awesome dishes. Thanks Debbie. Thanks for sharing your creativity. Thanks for hosting Linda, love this time of year. Your tablescape captures the season perfectly. 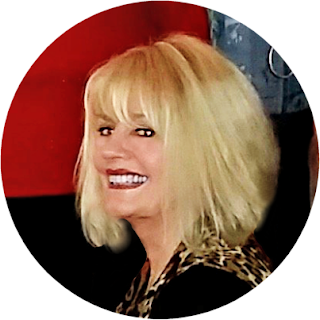 How sweet Cheri. Thanks for joining us. Happy cooking! Hi Linda, thank you for the party. Hope your week is awesome! You are so welcome Dianne. I appreciate you sharing your treasures. Thank you for the lovely party:) I adore this cute photo of your with a witches hat on! Thanks for sharing! Lots of inspiration.! Thanks for the invite :) and the party. 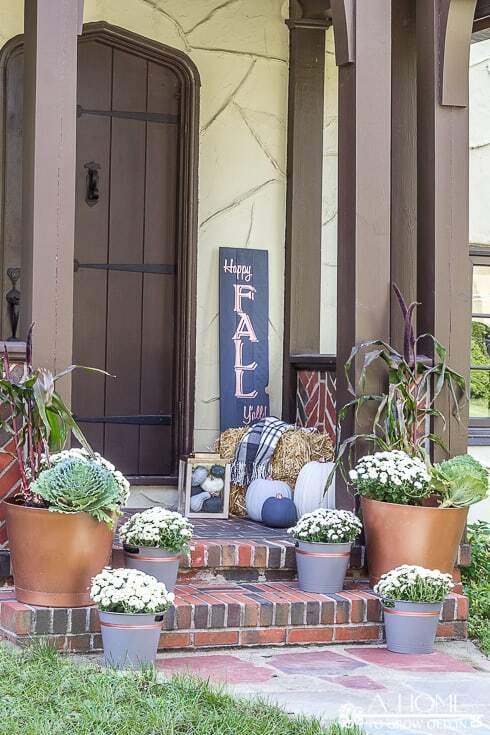 I love the autumn planter from THE BRICK NESTS. Thank you Amalia. I am loving the features as well. 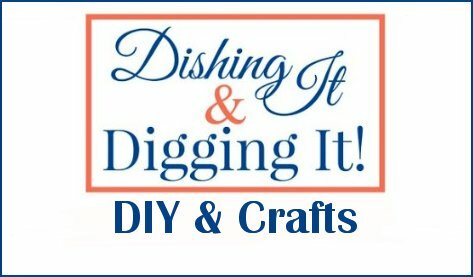 You had asked me to share at your linkup, so I joined up! However, I do see on your rules, you don't mention fashion, so if this isn't what you had in mind, I understand taking my link off? ?